The Governor of the Bank of England, Mark Carney, has made some interesting observations on both the Irish and Eurozone economies. 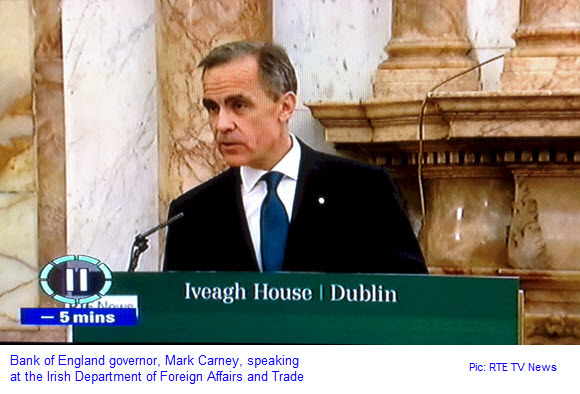 In a wide-ranging speech in Dublin, he was able, perhaps given his pedigree (his forebears emigrated from Ireland to Canada) and career to date (former Canadian Central Bank chief, and now head of the BoE), to deliver some home truths to all concerned. He talked of a debt trap in Europe. This has come about because of slower growth than should have been expected given the level of borrowing that took place in the past. Ireland was particularly at fault in this regard, borrowing more money per capita than most other nations for consumption, when it should have been for investment, which would have been calculated to provide the required expansion of the economy. That was then. This is now, but he was ready with a present-day solution to the problem too. The Eurozone needs a fiscal as well as a monetary union, with capital transfers across member state borders in order to redress the economic imbalances that exist. He should try telling that to Germany, where the real fear is that it will end up being the bailer-out of all other Eurozone countries, particularly those at the periphery. It is not as simple as that, of course. Thinking Germans know that the Euro has been good for them, but there is a sizeable voting population there that sees things in more black-and-white terms. Outside of Germany, talk of a fiscal union, which would pool all taxation and spending state functions, smacks far too much of a federal system, a veritable United States of Europe. There are many who object strongly to this, and not just because they like their own tax-raising powers. Cultural issues are very much to the fore also. The linking of debt and economic growth by Mr. Carney is interesting in another regard. One of the problems besetting the developed countries at present is a standstill, or even a reversal, in inflation. Central bankers, in particular, are concerned about this, as they fear it will encourage people to defer spending, particularly on big-ticket items. Others see it as a good thing, resulting in the pay packet of each worker going just that little bit further and providing for somewhat more day-to-day consumption, which is one basis for economic well-being in a country. But low or non-existent inflation, of course, preserves the value of all that debt over time, whereas rising inflation diminishes it in real terms. This means that economic growth and rising inflation could do the same job of mitigating the effects of the debt trap. They normally, of course, go hand-in-hand. But why did Mr. Carney not say so?